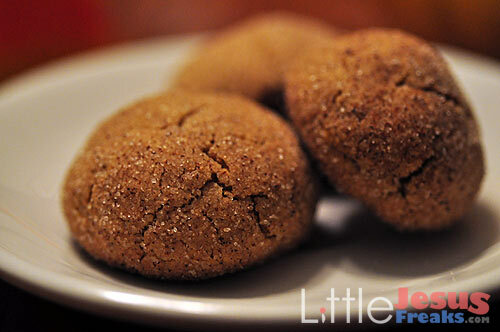 I have been making these cookies for the last several years, and they are a big hit in our family. I’ve made note of my personal variations, but you can make them according to the original recipe, if you like. I make half of the recipe with raisins, and half with chocolate morsels, for those like my daughter-in-law, Amy, who aren’t raisin fans. The cinnamon-sugar coating is awesome! In large bowl, combine quick bread mix, raisins, and ginger; mix well. Add margarine and egg; stir until dry particles are moistened. In small bowl, combine sugar and cinnamon; mix well. Shape dough into 1½ inch balls; roll in cinnamon-sugar mixture. Bake at 350 degrees for 12 to 15 minutes, or until cookies are set. This is a very old cookie recipe that I began baking for my kids when they were very young. It’s one of my favorites from my autumn baking collection. 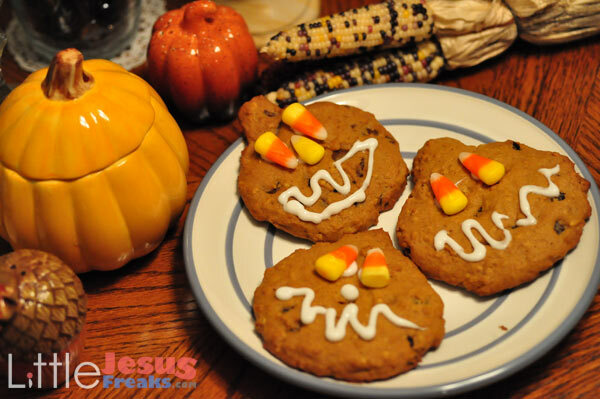 We always like to decorate these cookies with candy corn and cookie icing. Be creative! Combine flour, oats, baking soda, cinnamon, and salt; set aside. Cream butter; gradually add sugars, beating until light and fluffy. Add egg and vanilla; mix. 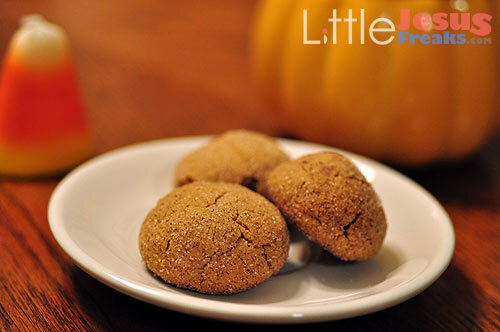 Alternate additions of dry ingredients and pumpkin, mixing well after each addition. Stir in morsels. spread into pumpkin shape, using a thin metal spatula. Add a bit more dough to form stem. Bake about 20 minutes, until cookies are firm and lightly browned. Decorate using icing or peanut butter to affix assorted candies, raisins, or nuts. Variation: Substitute 1 cup raisins for the chocolate morsels. I made these for the big Easter gathering at the Farro homestead this year, and they were such a big hit that I made them again for Mother’s Day. I’ve been using this recipe for more than 30 years, and I highly recommend it. Enjoy! Heat water and margarine to rolling boil in saucepan. about 1 minute. Remove from heat. Beat in eggs all at once. Drop dough by tablespoonfuls onto ungreased cookie sheet. Bake until puffed and golden, about 30 minutes. Cool away from draft. Cut off tops; pull out any filaments of soft dough. 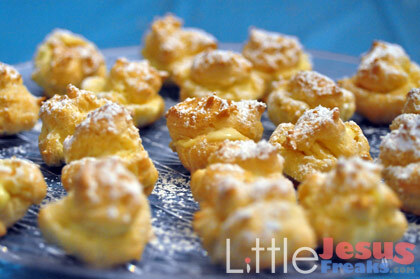 Fill puffs with cream filling. Replace tops. Dust with powdered sugar. Refrigerate until serving time. 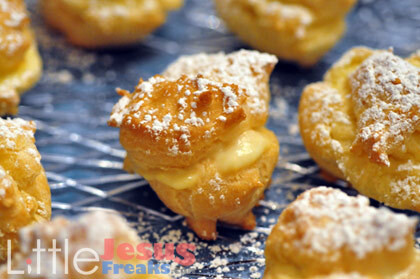 Makes about 20 cream puffs. Mix sugar, cornstarch, and salt in a 2-quart saucepan. until mixture thickens and boils. Boil and stir 1 minute. Stir at least half of the hot mixture gradually into egg yolks. Blend into hot mixture. Boil and stir 1 minute. Remove from heat. Stir in margarine and vanilla. Cool. These are the perfect cookies to make when it’s too hot to light the oven. My kids used to have fun making these after they got the recipe at school. Mix butter, sugars, milk, cocoa, and salt in saucepan. Boil for 1 minute at low heat. Remove from heat. Add peanut butter, vanilla, oats and flour. Mix well. Drop on waxed paper on cookie sheet or tray. Allow to cool in refrigerator. 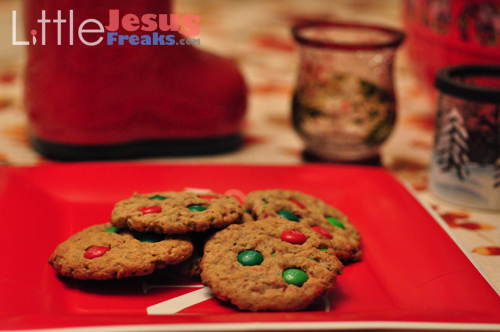 My sons, Joseph and John, were raised on these cookies, and they still love them and ask for them, especially around Christmastime. 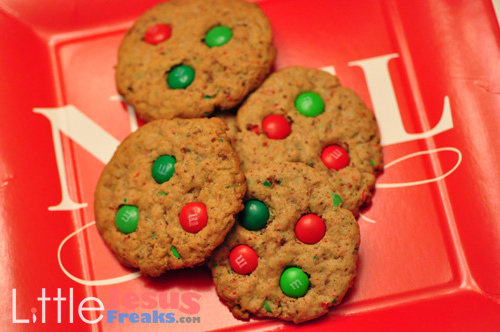 They are a delicious combination of crunchy and chewy, and the M&Ms make them look festive! Coarsely chop 1½ cups candies. Reserve remaining for decoration. Beat together margarine and sugars until light and fluffy. Blend in eggs and vanilla. Add combined flour, baking soda, and salt. Mix well. Stir in chopped candies and nuts. Drop by rounded tablespoonfuls onto greased cookie sheet. Bake for 9-11 minutes. Remove from oven. Immediately press 3 reserved candies into top of each cookie. I often make these at Christmastime, and my daughter-in-law, Amy, lights up like a Christmas tree when I do. Some people make these shaped in “knots,” but I like to make them round. Either way, they are indescribably delicious! Confectioner’s sugar, milk, and extract for glaze. Beat together melted margarine (or butter) and eggs. Combine the sugar, flour, and baking powder–and add to margarine and eggs alternately with the milk and extract. Mix until thoroughly combined. Grease hands with vegetable oil. Roll the dough in your hands about the size of a walnut. Place on ungreased cookie sheet. Bake for about 8 minutes, or until slightly brown. When cookies are completely cool, ice with confectioner’s sugar, milk, and extract. Sprinkle with nonpareils, if desired. 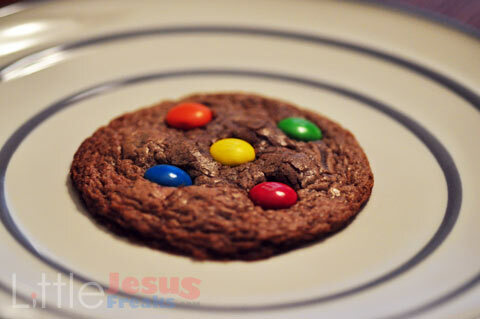 This recipe has been adapted to fit my son, John’s, tastes with the addition of M&Ms on the inside and on top. 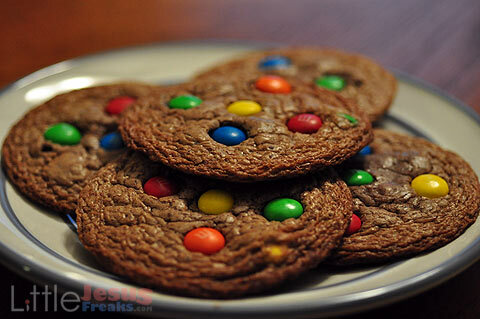 If your kids love M&Ms and chocolate cookies, they’ll probably be big fans of these, too! Combine brownie mix, egg, water and oil in large bowl. Stir until well blended and soft dough forms. Drop by level measuring tablespoons about 2-inches apart onto cookie sheet. Bake at 375 degrees for 7 or 8 minutes, or until cookies are set in center. Do not overbake. 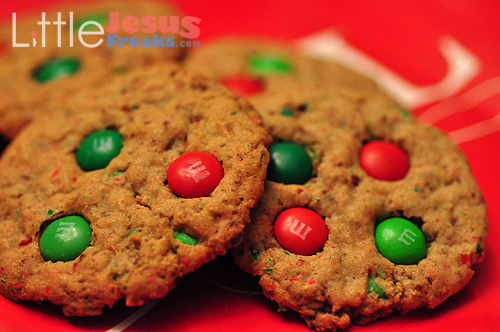 As soon as the cookies come out of the oven, press 3 M&Ms into the top of each one. Transfer cookies to cooling rack. (I place them on foil or wax paper.) Cool completely before serving. Preheat oven to 325 degrees. In a medium bowl combine the flour and salt with a wire whisk. In a large mixing bowl cream the butter and sugar with an electric mixer on medium speed. Add the egg and vanilla, and beat until well blended. Scrape down sides of bowl, then add the flour mixture. Blend on low speed just until combined. Do not overmix. Gather dough into a ball. Flatten the ball into a disk and wrap tightly in plastic wrap or a plastic bag. Refrigerate one hour until firm. On a floured surface, roll out dough to a 1/4 inch thickness. With cookie cutters, cut dough into desired shapes and place on ungreased cookie sheets. Decorate with colored sugars or sprinkles. Bake for 13-15 minutes, being careful not to brown. Immediately transfer cookies with a spatula to a cool, flat surface.